How to Find the Best Tactical Flashlight on a Budget? It’s no surprise that tactical flashlights are all the rage. They offer some excellent features that are perfect for outdoor adventures, dealing with a power outage, and personal defense. However, many tactical flashlights are priced well above the comfort range for those who may only see occasional use out of them. The good news is that the best tactical flashlight for the money is durable, offers plenty of features, and is quite affordable if you know how to find them. What separates a tactical flashlight from the standard versions starts with the blinding white light it can put out to deter potential assailants and have emergency personnel spot your location. However, there is more to a tactical flashlight than the very bright setting it offers. These are the most common features, but depending on the particular brand and model there may be others which include different color lenses for use with night vision equipment and so forth. The typical price range of tactical flashlights runs from roughly $20 up to $220 or more depending on the model. The good news is that you can purchase a good tactical flashlight for under $40 with some versions being as little as $20 while still including many excellent features. The first thing you should do is set a budget for purchasing a tactical flashlight whether it is for police or law enforcement, military personnel or personal use. You may also want to consider a military angle head flashlight that can stand on its own so you can use it hands-free. While you can find them as low as $20 or less, you might want to set your budget a little higher to get one with better features. 130 Lumens: That is the minimum brightness recommended for a tactical flashlight. The 130 lumens setting is more than enough to temporarily blind a potential attacker or get the attention of emergency personnel. Some tactical flashlights go up to 300 lumens or more, but they tend to be more expensive versions. Two Settings: You want a flashlight that can switch from a blinding light to a low setting for easy navigation in the dark. The lower setting can be from 5 to 15 lumens for many hours of operation. Tailcap Switch: A switch on the tail cap prevents accidentally turning on your flashlight which might quickly drain of power if left unnoticed. Plus, the tail-cap switch makes it easy to operate with one hand. Hard Casing: You want an aluminum casing if possible because it is lightweight, yet highly durable, corrosion-resistant, and can be used as a weapon if needed. In addition to the casing, a rubber grip surface is also helpful because it makes it easier to hold when wet. 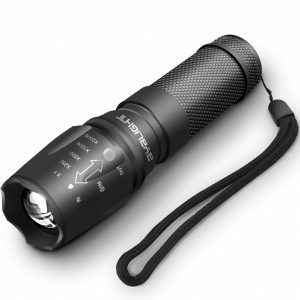 By following the minimum standards, you can purchase an excellent, durable tactical flashlight for a relatively small amount of money.